Home naatham தமிழ்நாதம் மகிந்தவே பிரதமர்! நம்பிக்கையில்லா தீர்மானம் செல்லாது! மகிந்தவே பிரதமர்! நம்பிக்கையில்லா தீர்மானம் செல்லாது! நேற்று நிறைவேற்றப்பட்ட தீர்மானம் நடைமுறைகளை பின்பற்றவில்லை எனவும், அதனால் அதனை நிராகரிப்பதாகவும் மைத்திரி எழுதியுள்ள கடிதத்தில் தெரிவித்துள்ளார். 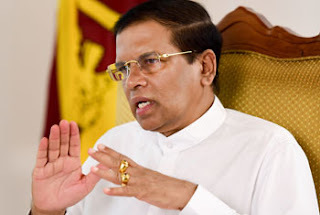 In a letter to the Speaker, President Maithripala Sirisena says that the Speaker of Parliament has ignored the Constitution, Standing Orders and Parliamentary traditions in passing the no-confidence motion against the Prime Minister. The letter is a response to the letter and attached documents sent by Speaker Karu Jayasuriya to the President regarding the motion of no-confidence passed during the parliament session this morning, against Prime Minister Mahinda Rajapaksa or the Cabinet of Ministers and government appointed on or after 26th October 2018. The motion had stated that the "Gazette Extraordinary Nos. 2094/43, 2094/43A and 2094/44 dated 26th October 2018 promulgated by the President, and the purported acts and appointments referred to therein, are unconstitutional, and are null and void and of no force or effect in law." However, the President in his letter to the Speaker says that the Gazette notifications in question were issued in accordance to the powers vested in him by the Constitution of Sri Lanka. He accused the Speaker of acting while ignoring the Constitution, Standing Orders and Parliamentary traditions although the Constitution and Standing Orders explain how a motion of no-confidence against the government should be presented and the process which should be followed to pass the motion. The President states that while the Constitution dictates that he appoints the Member of Parliament who commands the most confidence in the Parliament according to his opinion as the Prime Minister, there is no need or parliamentary tradition to show whether the Prime Minister or government has or does not have a majority. He also expressed regret over the Speaker's attempt to confirm the passing of the said motion of no confidence by sending him a list of signatories "not properly certified by the Parliament." In his letter to the Speaker, the President also categorically rejects the statement in the motion that the purported acts and appointments referred to therein, are unconstitutional. He emphasized that his decision are legal and comply with the Constitution. The President also points out that the date on the list of signatures of the MPs sent to him has been erased and the date of November 14, 2018 inserted on top.